Photo: Afsaneh Beschloss, Founder and CEO of RockCreek, and David Marsh, Chairman of the Official Monetary and Financial Institutions Forum. 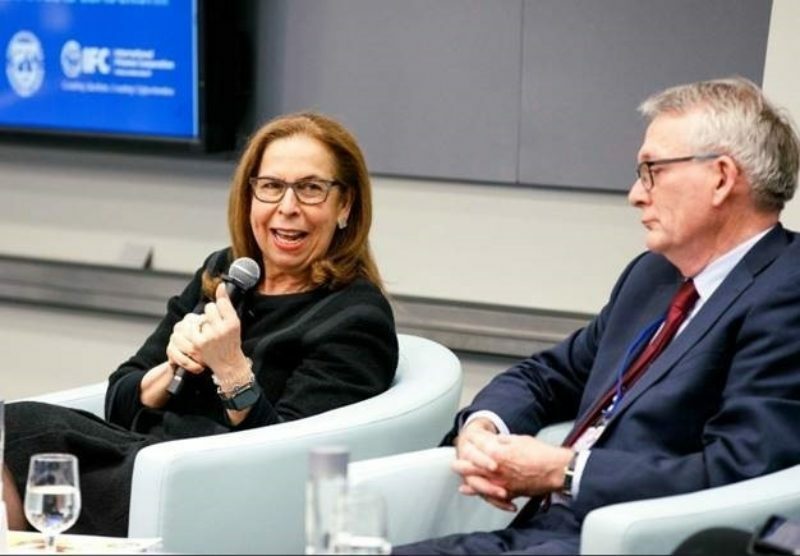 On Saturday, April 13, the International Finance Corporation and the International Monetary Fund hosted a panel on “Boosting Growth Through Diversity in Financial Leadership” during the World Bank-IMF spring meetings. The event was held at the World Bank Group headquarters in Washington, DC. The objective of the event was to highlight the underrepresentation of women at all levels of the global financial system, promote new research that shows greater diversity at the board and management levels leads to innovation and better productivity at firms, and present recommendations for addressing the gaps. Welcoming remarks were given by Hans Peter Lankes, IFC Vice President of Economics and Private Sector Development, and David Lipton, the First Deputy Managing Director of the IMF. Lankes, IFC’s Vice President of Economics and Private Sector Development, said achieving better outcomes for women and improving businesses performance should not be mutually exclusive. Studies show that diversity at the board and management levels leads to improved decision-making of teams, greater productivity, and more financial stability. Lipton said that we need to work to stop all violence against women, including in the workplace. Such violence “cuts the soul of the institutions,” he said, noting that the violence has a ripple effect, hurting women, companies, and economies. In addition to Afsaneh Beschloss, Founder and CEO of RockCreek, panelists included David Marsh, Chairman of the Official Monetary and Financial Institutions Forum, and Nor Shamsiah Mohd Yunus, Governor of the Central Bank of Malaysia. Bloomberg reporter Saleha Mohsin moderated the event. In the panel discussion, Beschloss recapped the findings of new research on gender diversity in private equity and venture capital – “Moving Toward Gender Balance in Private Equity and Venture Capital” -- which was co-sponsored by RockCreek and IFC. She said it was the largest such research in the world. One of the most interesting findings, she said, was that the percentage of women in senior positions in private equity across the emerging markets – albeit a small percentage -- was nonetheless higher than the comparable percentage in the developed world. Beschloss said that it is not enough for firms to hire diversity officers, they must hire women and experience firsthand their contributions. One of the misconceptions that high-ranking men in finance have is that women are disinclined to travel as much as men travel. She said that women who work in the World Bank and IMF would take issue with such a view. She also noted that if companies and funds want to increase diversity they have to do a better job in providing internship opportunities to diverse groups. The financial sector needs to have mentors who can advise women, several panelists said. Mohsin pointed out that women also need to look for allies in their organizations who can support their career advancement. Discussing some of the challenges, Nor Shamsieah Mohd Yunus, pointed out that lack of caregiving is a barrier for women in progressing in their careers. She described her experience of helping to build a childcare center for 400 children in her office building, so women could balance their family life with work—without sacrificing their careers. Marsh said it is disheartening to see a lack of women at the top levels of sovereign funds as well as at central banks of various countries. He noted that we need more female governors at the central banks of countries and that there has actually been a decline in representation in recent years. The Q&A session featured a lively exchange of perspectives between the panelists and audience.